THE BRITISH Asian playwright, Parveen Singh Bancil – always known as Parv Bancil passed away suddenly last weekend (April 2) leaving the British Asian artistic community is in a state of shock. It was later confirmed that he had a heart attack and his funeral which took place yesterday (April 12) was attended by over 200 people, including many personalities from the arts scene. It is a measure of how highly regarded he was that people came to pay their last respects and share their grief and solidarity. These included actors, Ameet Chana, Nitin Ganatra, Raj Ghatak, Shaheen Khan, Jonathan McGuiness, Nina Wadia, Daniel York, playwright and actor, Sudha Bhuchar, producers Ajay Chhabra and Sweety Kapoor, artistic directors, Vicky Featherstone (Royal Court), Pravesh Kumar (Rifco), Kully Thiarai (National Theatre Wales), Jatinder Verma (Tara Arts) and Madani Younis (Bush Theatre). Members from the Hounslow posse – such as curator and artist, Poulomi Desai, producer, Hardial Rai, filmmaker, Shakila Maan, actors, Ravinder Gill and Neran Persaud and Preet Bancil (Parv’s sister). The AL-Jazeera journalist Imran Khan (founder of 2nd Generation magazine), musician Aki Nawaz of Fun-Da-Mental, DJs Bobby Friction and San-j Sanj; theatre directors, Poonam Brah, Lisa Goldman and Harmage Singh Kalirai were also among the mourners who included his family and close relatives. His former wife, the actor, Shivani Ghai was also amongst the bereaved. The service at Mortlake Crematorium was followed by a religious ‘Bhog’ Ceremony reading and a langaar (a communal sharing of food) at the Gurdwara Sri Guru Singh Sabha, Hounslow. There were readings from the family where his niece recalled a “cool uncle”, while his sister, Jas Bancil remembered a “teenage boy from Hounslow who chronicled the ordinary lives of friends and neighbours with searing truth and honesty” in his plays. Tributes poured in over social media ever since his death became known. On both Facebook and Twitter, he was described as a passionate, opinionated, vocal and warm person who was brutally honest in his critiques about others work, but at the same time would be extremely encouraging to a younger generation entering the arts scene, via introductions and support. The 50 year old was born in Tanzania came to the UK aged two and grew up in West London, along with four sisters and an older brother – two of his sisters were also involved in the creative sector. He lost his mother around that time and was raised by his older siblings and his father. At the age of 19 he joined the Hounslow Arts Cooperative (HAC), a professional Asian theatre company. He had initially he had been brought in to be a stage manager but got involved in writing plays purely by accident. His first play, ‘Curse of the Dead Dog’, (1986) co-written with Ravinder Gill), is about three young Asian men who spend their time drinking. They are encouraged to set up a sound system and mount a benefit gig, which goes badly wrong when one of them informs the local Southall gang about this and the performance is sabotaged. Ravinder Gill, one of the members of HAC speaking in ‘British South Asian Theatres: A Documented History’ (edited by Graham Ley and Sarah Dadswell, 2011), explained that the genesis of the play came from when they used to hang around drinking with Parv’s mates in a park next to the Bancil household. Bancil proved to be a hidden talent and his work exposed the underbelly of Asian life and was hard-hitting. It was followed by ‘How’s Your Skull….. Does it Fit?’ (1988) the story of a woman who wants to be an actress but refuses to compromise herself. Other plays include ‘Bad Company’ (1990 & remount at Tara 1991), and ‘Kings’ (November 1990). (See picture below). After HAC closed in 1990, Bancil became a freelance writer with his work being shown at the Watermans Arts Centre, Brentford, London, where Hardial Rai (a former member of HAC) worked as a programmer from 1992 -2001), and produced many of his plays including two versions of ‘Ungrateful Dead’ and ‘Bollywood or Bust’ (1999), Harmej Kalirai, who directed, ‘Ungrateful Dead’(1993), said that the play was drawn from Bancil’s own experiences and was about Asian gangs in Southall. It received the Time Out Critic’s Choice award and led to his residency at the Royal Court around 1993-1994. His play, ‘Papa Was a Bus Conductor’ first performed in 1995 had many revivals including one in 2000 (where the Evening Standard critic said: “Asian comedy is all the rage, but few can match Bancil’s gift for the really worryingly insane.”). This was a surreal satirical absurdist comedy and is generally acknowledged as the inspiration for much of the second-generation British Asian comedy. He followed this up with hard hitting, ‘Crazy Horse’ (1997) for Paines Plough directed by Vicky Featherstone, and it was followed by ‘Made in England’ (1998), about the Asian music scene and selling out for commercial gain. Directed by Lisa Goldman (and originally developed by Red Room) it was set during the ‘Cool Britannia’ era. Bancil was a founder member of One Nation Under a Groove, a comedy revue circuit and was part of a comedy band, The Dead Jalebis (along with his sister, Preet, Desai, Gill, Persaud and Arvindra Bindra). His first radio play ‘Nadir’ won the BBC Radio 4 Young Playwrights Festival in 1991. 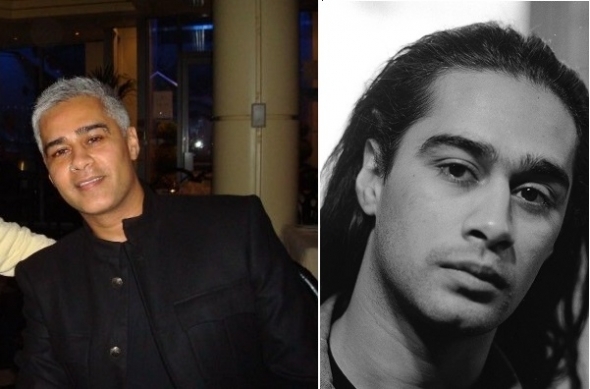 Ameet Chana (pictured above with Bancil more recently) who appeared in several of Bancil’s plays including ‘Crazy Horse’, ‘Bollywood or Bust’, ‘Ungrateful Dead’, and ‘Bad Company’ summed up the feelings of many through his heart felt tribute posted on Facebook. Parv Bancil was a dapper handsome man and as a teenager used to support a dreadlocked, leather jacket moody motorbike look, but as he grew older, his short silver hair look became quite distinctive. He had an attachment with Soho Theatre, wrote the text for two dance pieces choreographed by Darshan Singh Bhullar. This question seems even more apt today. Over the last decade he went to study film at Central Film School London and was moving more and more into writing and directing films. “He was a striking, radical playwright with a distinctive voice”, explains Graham Ley, Emeritus Professor, University of Exeter, who was a lead investigator into the major Arts and Humanities Research Council funded research project on the history of British Asian Theatre. A tribute event marking Parv Bancil’s contribution to British art and culture is being organised for later this year – stay connected for details.